DIY Composting is becoming more and more popular. Instead of buying bags of commercial compost from the local garden center more and more households are turning their kitchen and garden organic matter and vegetable waste into a nutrient-rich humus material that results when these organic waste materials are converted into beneficial soil additives that is essentially a living soil life that is bursting with nutrients. Best of all, making your own compost is a fairly simple way to turn what is traditionally considered to be waste materials into a valuable resource that can be added to gardens and flower beds. Best of all, it is virtually free when you make your own compost! Most rural folks have some sort of compost pile "out back" and this can be something as simple as a patch behind the fence where the kitchen scraps, wood shaving, grass clippings and paper waste is piled up and left to breakdown into compost. Simple wooden-slatted boxes are common. Something that allows the pile of potato peelings and coffee grounds to be contained and to enhance the process of biological breakdown. Leaves and garden shreddings are added to the pile and stirred once and a while...the usual farmhouse or country home didn't pay too much attention to the compost pile but more and more people are looking at more efficient ways to create this resource instead of buying it. Newfangled composting containers and systems are on the market and almost every home and garden center has some floor-space devoted to an interesting array of globe shaped composters, lighthouse shaped composters or fences and build your own systems. If you look on the Internet there are forums and groups devoted to discussing and improving the composting process. The nutrients in healthy compost can be described as a full-spectrum rainbow of all of the Earth's good stuff! Everything plants could probably need are found in your own pile! A full host of micro-nutrients that are key to the development and flourishing of gardens and crops are found in this black gold. Synthetic fertilizers can't match the quality of a homemade compost and such basic elements as manganese and iron are often absent in commercial or chemical enhancements. Natural compost will release nutrients slowly over time; you don't need a fancy "time release" fertilizer because the natural chemistry and nutritional value of good compost is a natural slow-release product that mixes with your existing soil to help retain nutrients better than artificial fertilizers can do and can revive basically lifeless soils and ensure that if you do add a fertilizer product your compost material will enhance the benefits many times over! Barbara Pleasant and Deborah L. Martin turn the compost bin upside down with their liberating system of keeping compost heaps right in the garden, rather than in some dark corner behind the garage. The compost and the plants live together from the beginning in a nourishing, organic environment. A readable, quietly humorous introduction to composting, this covers reasons to compost; differing approaches; how decomposition works; various methods, ingredients, and containers; how to speed decomposition; and how to use the end result. Campbell is an experienced gardener, and the book goes into great detail, but the text remains clear and interesting. If you have acidic or alkaline soil structure then using your own compost will help reestablish a balance to the soil and assist in restoring pH levels to a more optimized range that helps best utilize the available nutrients for your crops, flowers or vegetables. One critical aspect is the actual soil structure and how adding compost will help bind soil particles and aggregates so that air pockets and pores can be created that help trap and hold nutrients like a moist sponge. This microscopic zone of buffered nutrients is created in the pockets and spaces that are created by stirring and mixing existing soils or spreading the compost and mixing. Normal clay particles are broken up and any restrictive or bound-up particles of soil will be "fluffed" with the rich organic mix which will allow a better root penetration of trees, shrubs and flowers as well as vegetables. This expanded volume in the soil and increased structural integrity also helps reduce erosion around your garden or in fields when it is mixed with your soil. Vegetables are more easily able to uptake the primal nutrients when compost is added but also, because of the healthy nature of the new soil, the soil better resists having these new nutrients washed away as the "sponge" that has been created prevents a drastic leaching of elements out with rains or floods or over watering. Insects and worms and natural bacteria that flourish within the Earth are better supported and the vigorous growth and vitality of these essential life forms help to improve the entire food chain and growth cycle. By burrowing into this nutrient-rich mixture worms and helpful insects ensure that the soil is well aerated naturally and help to keep it loose and prevent unwanted compacting and hardening. Some of the more helpful soil bacteria can convert nitrogen that is in the atmosphere and make it available for the plants. Because the compost can supplement the beneficial microorganisms that thrive in the soil your plants will have natural immunities developed to diseases and pests. Many harmful molds or diseases are less inclined to proliferate in these healthy surroundings so you'll be doing the equivalent of having your garden do exercise and take her vitamins as well as being happy with a positive outlook! No wonder your garden will be amazing!! Unique 2 in 1 formula that contains both naturally occurring beneficial bacteria AND beneficial fungi for rapid compost acceleration. This is certified non-genetically modified and non-pathonogenic. A robust and healthy microbial population is essential for successful composting and creating a flourishing organic fertilizer, which is why a quality natural compost starter like Compost Booster is a necessity in both compost piles and compost tea. For Pile Composting mix 1 oz of product will treat 1 cubic foot of compost material. Mix 1 oz of powder with 1-2 gallons of water and apply to a WET compost pile. Keep the compost material at the dampness of a wrung out sponge. For faster composting,turn the compost pile every other day for 7- 10 days. Repeat every 7-14 days or as needed. For Sludge Composting sprinkle 1-4 pounds of product per 500 pounds of compost material to be treated. Aerate as needed. Adjust the moisture content so that the pile feels moist and spongy, but does not remain compacted when squeezed. Repeat every 7-14 days or as needed. With the compost boosting microbes you will establish a simple "continuous feed" approach, compost is ready in 6 months to 2 years. This practice does not destroy any weed seeds, runners or plants. Vortex Brewer Junior Unique Features - "The Little Brother of the Vortex Brewer still packs a punch!" The Vortex Brewer Junior is a compost tea brewer and the little brother of the Vortex Brewer. At a 10 gallon volume, it is not a commercial unit, but makes the power of the vortex available to the home and hobby gardener. There are no water pumps used to accomplish the vortexial circulation in the Vortex Brewer Junior, the movement of the water is accomplished entirely by the influx of air. The Vortex Brewer Junior uses the natural stimulation of the vortex rather than aeration to stimulate biological activity and create living water. Microbes make plant food, and the Vortex Brewer Junior is a potent method of growing beneficial microbes that when added to the garden act as teammates to growing plants. Kitchen materials with mixed yard trimmings including grass clippings, flowers and stalks, leaves, weeds without seeds or spreading roots, twigs ad small branches collected and crushed or piled. 8. Are you finished? Well... when the material at the bottom of your compost pile looks like dark rich soil, you have created a successful compost! When it is convenient, move any non-decomposed materials into a new bin or fresh pile and harvest and use the compost you have created! The is a tea brewer that is ideal for homeowners, small nursery operations and research environments. This model delivers reliable performance with greater portability and convenience. 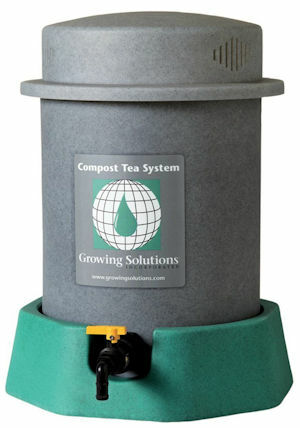 The patented Compost Tea System is designed for durability, ease of use, and years of safe and consistent operation. This 10 gallon tea brewer features a patented design, industrial grade components, easy maintenance and fine bubble diffusion technology. Fine bubble diffusion technology is a constant dynamic aeration process. Each fine bubble diffusion aeration disc has more than 4,000 engineered perforations that provide consistent air bubble size and velocity. This constant aeration process ensures maximum oxygen transfer efficiency, creating an optimum environment for reproduction of beneficial microorganisms. The compost tea solution is thoroughly mixed by the fine bubble diffusion aeration process inside the tank, eliminating the need for external agitation. Each disc's perforations self-seal when the system is off, preventing back flow of compost tea into the air manifold. More than 4,000 1mm perforations in our fine bubble diffusion discs ensure optimum oxygen levels are maintained while providing thorough mixing of the compost tea solution. After 24 hours, the compost tea brewing cycle is complete. Use your compost tea as soon as possible as it contains living microorganisms. Apply as a foliar spray or soil drench with a sprayer, watering can or other application equipment. By popular demand, HOMGRO presents our compact version of the exact same system that has made our model eco farm so famous around the world! Perfect for the backyard gardener and sustainability enthusiast. The HOMGRO Quick and Easy Compost Tea Maker TM kit (patent pending) is designed to brew a highly effective, completely organic nutrient-rich liquid fertilizer in just 48 hours! This liquid fertilizer, diluted with non-chlorinated water, can be sprayed on all vegetables, plants, flowers, trees, and bushes creating dramatic results. Included in each kit is a bag of *HOMGRO's Living Microbe Compost, a special blend of thoroughly composted small animal waste and worm castings mixed with a proprietary blend of fish emulsion; a packet of *HOMGRO's Microbe Activator which feeds the microbes creating a "microbial baby boom"; a nylon filter; and the Quick and Easy instructions to brew/apply the tea, and maintain/store the unit. The electronic pump securely attached to the lid works quietly providing twice the power needed for optimum aeration. One batch of tea yields 9 to 10 gallons of fertilizer. The HOMGRO Compost Tea Maker TM unit comes fully assembled and ready to use right out of the box. *All compost tea ingredients are packaged without chemicals or preservatives. Note: A foliar sprayer is required for applying HOMGRO's Compost Tea. For fast and odor-free decomposition of compost piles proper aeration is required; aeration can also be very effective to reduce moisture content in your compost materials. One of the most critical aspects is to ensure that material on the leading edge or outside of the pile is circulated or turned to the center of the pile so the higher temperatures created by the biological process can be achieved and maintained. Beyond the mechanical turning of compost piles, especially in larger municipal and commercial compost operations, forced air systems to aerate the compost are extremely common. High volume air blowers feeding air through diffusers and tubes can be used to ensure that the proper high temperatures are achieved throughout the pile. This graph on the right is from a study at the University of California that shows that if frequent turning or aeration at regular intervals during the first two weeks is performed the stabilization will be similar to making the equivalent number of turns over a longer period. The increased aeration during these key stages of composting will intensify the microorganisms involved in the decomposition process. - Compost moisture level: Between 60% and 70% turn four or five times at intervals of two days. - Between 40% and 60% turn three or four times at three day intervals. - If moisture is below 40% then you need to add water! - If you have a more saturated moisture level of more than 70% you should turn the compost every day until the total moisture content averages less than 70%. Barbara Pleasant and Deborah L. Martin turn the compost bin upside down with their liberating system of keeping compost heaps right in the garden, rather than in some dark corner behind the garage. A readable, quietly humorous introduction to composting, this covers reasons to compost; differing approaches; how decomposition works; various methods, ingredients, and containers; how to speed decomposition; and how to use the end result. Everything you need to know to succeed at compost. Industrial composting systems are increasingly being installed as a waste management alternative to landfills, along with other advanced waste processing systems. Mechanical sorting of mixed waste streams combined with anaerobic digestion or in-vessel composting is called mechanical biological treatment, and are increasingly being used in developed countries due to regulations controlling the amount of organic matter allowed in landfills. Treating biodegradable waste before it enters a landfill reduces global warming from fugitive methane; untreated waste breaks down anaerobically in a landfill, producing landfill gas that contains methane, a potent greenhouse gas. Vermicomposting is used for medium-scale on-site institutional composting, such as for food waste from universities and shopping malls: selected either as an more environmental choice, or to reduce the cost of commercial waste removal. . Most composters judge what composition of the material will provide good compost by appearance. An experienced operator can generally do proportioning from visual estimates of the quantity and character of the feedstock. In large-scale municipal composting operations, however, there may be times when operators rely on laboratory analyses to determine how the various materials should be blended or proportioned for composting. The C:N ratio and moisture content are the two factors to be considered in blending. There is no need for blending when the C:N ratio is between 25 and 50, although 30 to 40 is a better range. If materials containing much paper, straw, sawdust, or other substances rich in carbon are to be composted, the C:N ratio materials should be proportioned to provide a near optimum C:N ratio. Similarly, materials too dry for good composting and materials too wet to compost without odors should be blended in proper proportions. Where initial shredding is practiced, proportioning can usually be done at the shredder; otherwise, the materials are mixed and placed in piles together. Making and using compost is the cornerstone of organic gardening - if you want to 'Grow Your Own', there's no better place to start. The finished product is rich, dark, crumbly and sweet-smelling. It is made of recycled garden and kitchen waste, and can also include paper products. It is used to feed and condition the soil and in making potting mixes. Around 40 per cent of the average dustbin contents are suitable for home-composting so it helps cut down on landfill too. Making compost is often considered to be complex but all you need to do is provide the right ingredients and let nature do the rest ? however, a little know-how will help you make better compost, more efficiently. Where do I make my compost? There are a variety of bins on the market but they are all just a container for the composting process. A bin is not strictly necessary ? you can just build a heap and cover it over with some polythene or cardboard. However, bins do look neater and are easier to manage. You can build your own, buy one from any number of suppliers, including The Organic Gardening Catalogue, or get one cheaply from your local council ? contact the Waste and Recycling Department at your local council for more information or visit the recycle now website: www.recyclenow.com .